I had the great pleasure of receiving American Crafts new "Margarita" line to review. American Crafts has been around for awhile and I am always drawn to their bright, fun colors and graphic patterns. This new line does NOT disappoint! Ease of use: One of things I love about American Crafts is that they have a central color scheme and the "Margarita" line has that. Not only is it bright and graphic but the embellishments, stickers, thickers, rub-ons, ribbon, you name it all coordinates! I love that! It makes it easy to mix and match and do it knowing that your embellishments are going to go perfectly with your paper! Construction and Durability: This is the reason why American Crafts is one of my favorite companies to work with. Their paper is amazing! Thick, yet easy to use and manipulate. The "Margarita" line also offers papers with great texture! Raised glitters dots, raised slick paper (great for water layouts) just to name a few. I found all their stickers and 3-d embellishments a joy to work with! Usefulness: Another one of my favorite things about American Crafts products is that their papers are double-sided giving you more options and more paper for you buck!! I am quite sure that if you don't care for a print on one side you will find a use for the other! Cost effectiveness: Because of the double-sided papers the incredible construction of their embellishments I would have to give this line a two thumbs up for cost effectiveness! What I liked: Everything! This particular line was so fun to work with. I love to scrap vacations but I also liked that I could adapt it to other subjects as well. I love the thickness of this paper and the embellishments were top notch. I especially love the fact that everything is color coordinated so you really can't go wrong! What I didn't like: Aside from a couple of patterns that I may not have much use for I found nothing about this line that I didn't love!! 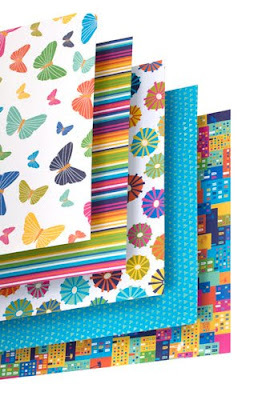 American Crafts once again delivers a fun, vibrant, graphic line that is easy to use! I loved working with these products and I would highly recommend them to other scrappers who are looking to use this multipurpose line! Happy creating! What do you think? Is this a line you would enjoy? Leave a comment by midnight EST on Thursday to win an American Crafts prize pack! I love the bright colors of this collection! TFS! Love the fun colors. American Crafts comes up with another great line. So cute! Love your album and layout! This collection is PERFECT for summer! These are great colors for summer layouts. Your mini album is awesome. I love it! I have not seen this collection yet, but I have to agree with your assessment! AC papers are a staple to any craft room. They are always classic. 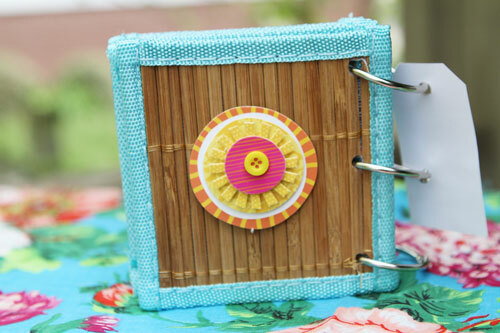 Your bamboo coaster mini album is so darling! Yes, I love the bright cheery colors of this collection! Love the bright colors! 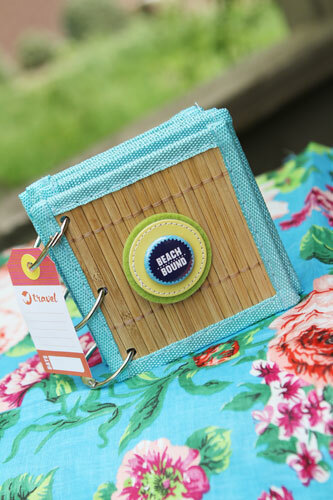 Your bamboo coaster mini is adorable! Very pretty little album you made! Teal is my fave color, so of course I love this collection! I have just found your site today - so happy I did! It's impossible financially for me to buy every new product on the market - seems like your site will be able to help me determine what is a waste of time & what isn't. I am loving the great colors in this new line! Are you not the most amazing creator??? ?...I LOOOOVE your mini bamboo album...so inspiring! This line looks absolutely awesome...the colors are vibrant and so versatile to use with LO's or even cards and will certainly make someone's day brighter! Thanks for the chance! Lovely colors and patterns, would fit my summer scrapping of my very new grandson.. So much hope to win! I'm loving this collection! Such fun colors and designs. I absolutely love your mini album! What a fabulous idea! I think the colors are super way fun and I can never get enough flair!!!! That bamboo coaster album is so cute. Would love to win this collection by AC. Love that mini album! <3 I'm pretty sure this line would be fantastic for all our summer backyard pictures! Ooh, love this line's colors. That coaster album rocks! I did a coaster album with the beer coasters from bars to make a girls night out album. Love the bright bold colours!!! Perfect for summer! Love that layout and mini!!! American Crafts is one of my most favorite paper companies. I LOVE the bright colors in this line of paper. oh my, the bamboo mini is the cutest! Love the bright colors of Margarita - so great for scrapping summer memories! SUPER cute! I LOVED your bamboo mini album! What a GREAT idea! :) Thanks for the chance to win! I love all the papers. How summery and fun. What bright and bold colors, too. Thanks for sharing. This looks like the perfect summer collection with all the bright colors. Would make great beach layouts. I'm a huge fan of AC and this collection is bright fun and perfect for summer. I adore this mini album, great project for this line! I love this line! It is so happy and summery! It looks like a ton of fun! I love the bright colors and would love to scrap some summer layouts with this line! I like! Thanks for the chance to win! Margarita is amazing!! 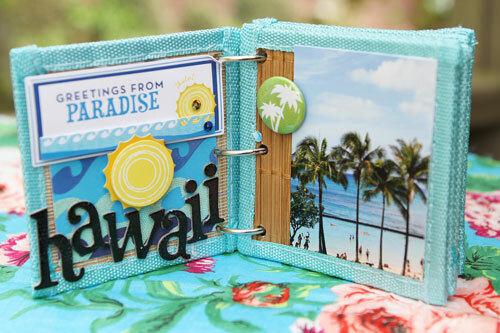 I'd love to scrap my upcoming vacation to Hawaii with it! PS. Love the mini album!!! I LOVE this line! I have been drooling over it and am so happy to hear such a great review of the product. Very cute and refreshing line! Love your bamboo coaster mini!!! Love the shiny buttons - it's so very summery! I love the colors in this! Thanks for the chance to win! I would love to get my hands on this collection! I can see myself making so many beautiful layouts for my summer vacation, it is such a beautiful line. The colors are so vibrant! It's such a fun collection ! This is one of my new favorite lines because of the bright colors which makes me think of our great vacation cruising to Cozumel! I also like the well-coordinated lines of American Crafts! I love these happy and bright colours. I should like to work with these papers and embellishments. I love this line - the colours are so vibrant. I just wish I had a fab holiday lined up to to them!! 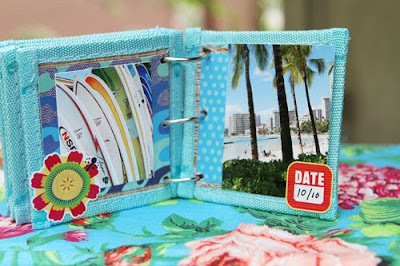 Loved the mini scrapbook, what a cool idea! AC is a staple in my scrap booking life. I use it regularly so this fun color would fit right in with my color scheme! Love the bright colors of the papers. These are some fun papers! I love the color scheme. And I agree with you on AC quality. I actually bought a line on clearance at M's that I knew I wouldn't use much of the papers, but the backs were white in that pack, so I have been using it for the insides of my cards. SO nice and durable. I love AC. such fun bright papers!